We are putting together an agenda for a QP user group meeting at ACRL in Baltimore, on March 30 from 3:30 PM to 4:30 PM (location to be announced). Please let me know what topics you would be interested in discussing at this meeting – either by responding to the list or sending me an email message at [email protected]. We will need to bring QuestionPoint down again tomorrow morning, Wednesday, February 14, at 1100 GMT (6:00 a.m. EST). We expect no more than a few minutes down time. This install will fix the problem of the non-displaying daily statistical reports in the Administration module. QuestionPoint will be down briefly tomorrow, Tuesday 13 Feb 2007, 1100- 1115 GMT (0600-0615 EST), to complete some necessary maintenance on the system. We apologize for the inconvenience this may cause some of our users and thank you for your patience. 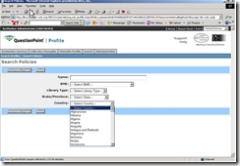 On many occasions, an entire classroom may log into the local virtual reference service to ask a question. When large groups of students who appear to be from the same class all simultaneously click to chat with a librarian, we call this a "class bomb". We are all pleased when students discover the service, since this provides an opportunity to introduce students to the concept that librarians are there to assist with reference needs. However, it can certainly be overwhelming when an entire class logs in at the same time, especially since this takes up the capacity of the network very quickly. If your service does get numerous class visits, then please do add a "class visit" link to your website, and a "class visit" script to your scripted messages. This will assist the other Cooperative members when helping your students. 2. Most of the students are happy with one or two web pages. Once you say hello to the student, go ahead and send a web page to get them started. Usually you won’t need to spend a lot of time with each student. If they need additional information, suggest that they talk to their school librarian to get additional assistance. It is not uncommon for students to use a shared email, or an email that is not their own. Thus it is better, for class visits, that you not send to Follow Up but rather to suggest that the students consult with their school librarian, if additional assistance is needed. Many librarians in the Cooperative have been monitoring during a "class bomb". Please share your best practices concerning class visits with the group! This Sunday, February 4, we will install some changes to the QuestionPoint system. The attached document lists the few user-apparent features and fixes you can expect to notice. The system will be brought down at 0800 GMT and will remain down for approximately 15 minutes. We hope you'll be pleased with the changes. As always we appreciate your patience during the down time. QuestionPoint Blog Is No Longer Password Protected! As you probably know by now, this is not really a change to be installed, but is already a fact. You can bookmark http://questionpoint.blogs.com/ and not worry about a login and password. 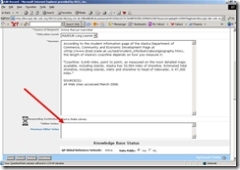 All Knowledge Base editors, whether working within their local knowledge base or in the Global Knowledge Base, can edit records after they have been activated. This change will allow for missed typos to be corrected or inadvertently omitted information to be added to the Question or Answer fields. And perhaps best of all, any librarian who originally submitted the record to the knowledge base will be able to Update the active record! The Update routine is now just like the Edit routine with one exception: you must indicate in an Editor Notes field the nature of the change you made. How detailed the note should be is a matter of local policy. 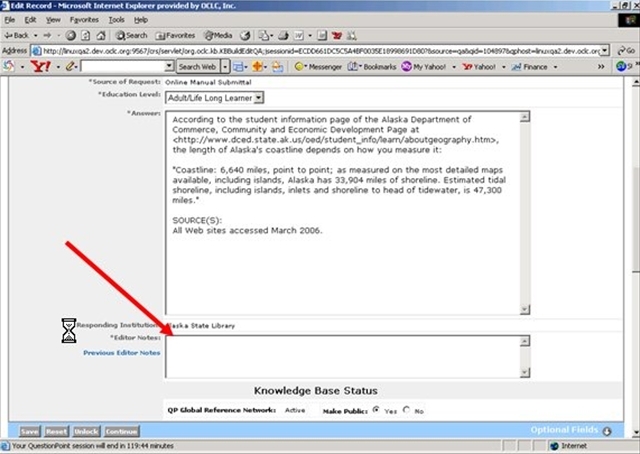 Librarians can now browse all knowledge base records with a Required Update Date by a date range. The new option appears at the bottom of the Browse page, with the existing Answered, Submitted, Modified options. Inactive accounts are now indicated in drop-down selection lists as “Blocked.” You will be able to easily identify which institutions are no longer participating in your group, when you select institutions to report on in Ask/Reports or the Profile module. 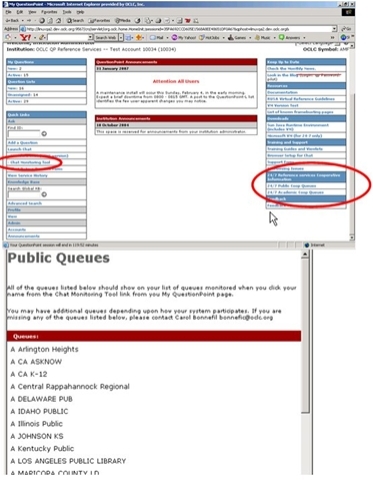 Users can now view what queues are in the Public or Academic Cooperatives to compare with the queues listed in the Chat Monitoring Tool. See the illustrations below. The Country list in a Policy Page search is now alphabetized. 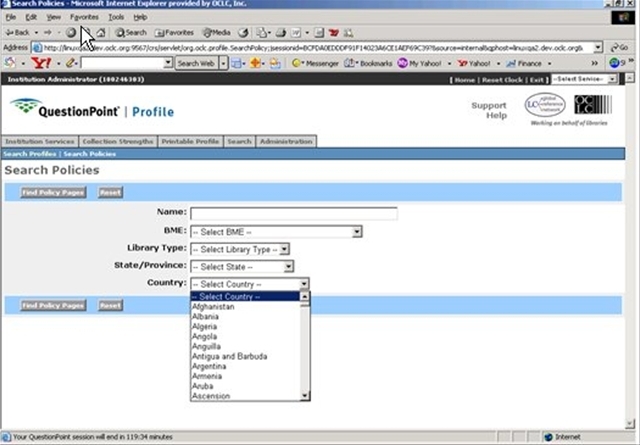 To facilitate searching on the Policy Pages search page, the drop-down menu of countries to select from has been alphabetized. QuestionPoint-wide reports are available to all librarians from the My QuestionPoint home page. 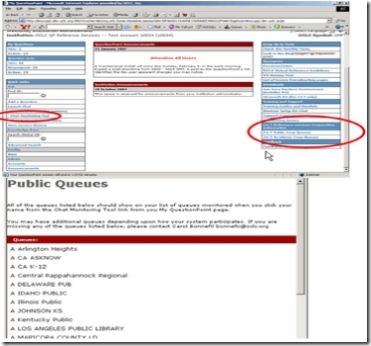 With the appropriate permissions from your administrator you may also see institution- and even librarian-level reports here. The Number of Chat Sessions Accepted is now appearing as it should, in the Chat section of the reports. The timestamp appearing on transcripts that administrators may have exported now have the same timestamp as these same reports viewed online, in Ask/Reports/General. That timestamp represents the local time of the librarian viewing the report. Knowledge Base icons now appear for Q&As submitted. Icons that indicate a Q&A has been submitted to the local and/or Global knowledge base are again appearing in the question lists in the Ask module. Librarians can again copy group-level (BME) scripts into the Answer entry box in the Ask module. When a patron replies to the transcript they have received, the reply is now displayed appropriately in the question history. Furthermore, a question-mark icon, indicating a question that needs attention, appears before the transaction in the New questions list.